Eeeeeeks! What do I have to do to get some action around here? My Dad has been sitting at the desk, he has several stacks of paper spread out….and I am feeling….ignored. I’ve tried head-butting and that resulted in a short walk after breakfast. But, tossing a BusyBone (registered trademark) right at My Dad got me nowhere. Tossing the tennis ball du-jour right at My Dad got me nowhere. Napping….napping….napping….more napping. Mmmm…I am going to bore my audience if I don’t think of something. Ah! how about the trip to the vet on Monday? OK. But My Dad did not have his Scion xB. Did I tell you about the loud BANG several weeks ago. I was in the xB, My Dad was driving back from Rockford (big surveillance). The Scion was northbound on Route 53 and I heard My Dad say the ‘F’ word, and a split second later there was a LOUD BANG under the Scion. My Dad kept telling people about seeing a receptor trailer hitch with the ball hitch attached right in the center of the center-lane. My Dad said that he thought he would clear it…nope. Over three thousand dollars damage…two cross-members were displaced, a hole was punched through the floor pan, the plastic fuel tank was nicked (but not punctured), a heat shield was displaced. Jeez! Everyone My Dad talked to said we were really lucky. So, My Dad does not have his Scion xB for awhile. He has a light blue Dodge Challenger four door. 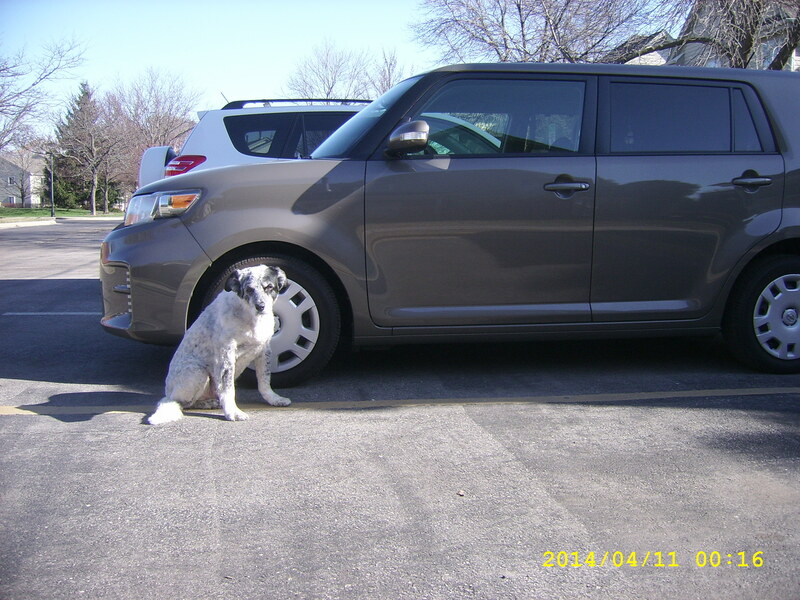 I got to ride in this light blue car to the vet – to get my Adequan shot, for my hips. I walk in and the waiting room is packed with dogs. But, you know me – Mr. Calm-Cool-Collected. I walk in like I own the place. I look every dog in the eye; the Boston Terrier with the bulging eyes, a very laid-back Flat Coated Retriever, a female BC mix who is thinking she’d like to bite me, a very bored female Mastiff, and some little hyper dog who just cannot be still. I look at My Dad, lie down (automatically) and wait. Another dog, a Doodle something, is drooling…yuccch…(DUDE, calm down). They call me in (“Hi Cody, Hi Cody, Hi Cody, Hi Cody”), I get the shot (“He is SUCH a good boy!”)and we’re outta there (please get me out of here, get me away from all of these moronic canines). Wait, wait…My Dad is putting on his jacket, the jacket with the plastic bags in the left pocket, he just picked up a tennis ball…gotta go! Cody, you are the dog! To stay calm, cool and collected, even at the vet’s. Dog of steel is more like it!